يضمن فندق فندق رويال الذي رمم في 2013 لزائريه قضاء وقت ممتع في برث، سواء جاؤوا في رحلة عمل أو سياحة. يمكن من هنا للضيوف الاستمتاع بسهولة الوصول إلى كل ما تقدمه هذه المدينة النابضة بالحياة. بالنسبة لمن يريد الخروج، هذه بعض المعالم السياحية المتوفرة للزوار Essential Beauty Raine Square, ‪Water Labyrinth‬, Twilight Hawkers Market. كما يقدم فندق رويال الكثير من الخدمات لإغناء رحلتك في برث. لضمان راحة ضيوفه، يقدم الفندق الخدمات التالية: خدمات بريدية, تخزين الأمتعة, غرفة عائلية, مطعم, جولات . استمتع بوسائل الراحة الراقية في الغرف أثناء إقامتك هنا. بعض الغرف تتضمن إغلاق, تلفزيون بشاشة مسطحة, غرف لغير المدخنين, مكيف هواء, تدفئة لمساعدتك على استعادة طاقتك بعد يوم طويل. كما أن مجموعة الخدمات الواسعة الموجودة في الفندق لضمان راحتك تترك لك الكثير من الخيارات لقضاء وقتك أثناء فترة إقامتك. إن فندق رويال هو خيار ذكي بالنسبة للمسافرين إلى برث، بما يوفره من إقامة هادئة ومرحة. مكتب الاستقبال مفتوح من الساعة 08:00 صباحًا إلى الساعة 05:00 مساءً في أيام الأسبوع العادية. لذا، على النزلاء الذين يصلون في عطلات الأسبوع وخارج ساعات العمل هذه تسجيل الوصول في فندق وينتوورث بلازا الذي يقع في 300 Murray Street. يكون مكتب الاستقبال مغلقًا في أيام العطلات الرسمية. يجب أن يقوم النزلاء بتسجيل وصولهم في العنوان التالي: 300 شارع "موراي". سيغلق مكتب استقبال العقار إلى أجل غير مسمى، ويجب على النزلاء تسجيل الوصول في كومفورت إن وينتورث بلازا. ويقع في 300 شارع ميوراي بين ذا بوهيمي وذا مون وذا سيكسبنس، خلف العقار مباشرةً. وهذا المكان يقع على بعد 3 دقائق سيرًا على الأقدام من العقار ويعمل على مدار الساعة. ويستلم النزلاء هنا مفتاح للباب الأمامي وأيضًا مفتاح للغرفة. لطرح أي استفسارات أخرى، يُرجى الاتصال بالعقار مباشرةً. Great for anyone attending convert etc at Perth Arena.100 meters to walk. Room renovated. Comfy bed. Very clean and good shower. Our room was at front of hotel with noise from road and a building site opposite. However the noise was over by 10pm. Location is convenient to everywhere, easy to find, walkable to Northbridge (Chinatown) and Supermarket Coles is just beside. Perth Free bus CAT blue, red and yellow line just within 5 min walk distance. Hotel is a historial building with remain her vintage look, but still maintain in a good condition and provide heater,so still warm in winter. If you rent the car from Europecar, just need 15 min walk distance from hotel, not so far, because the scenery is beautiful. 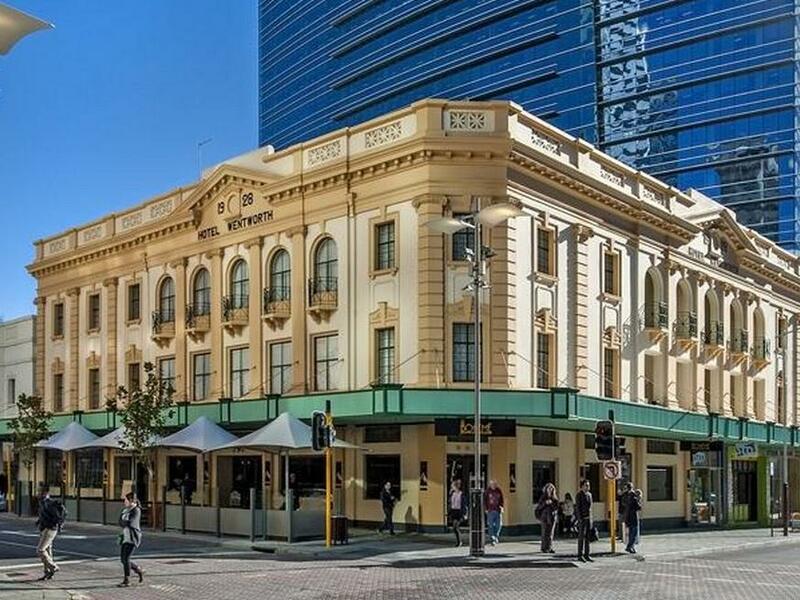 I stayed at this hotel with my mum from 10/3/2016 to 19/3/2016.We had a pleasant and good stay at this hotel.I definitely would book this hotel again if i were to go to Perth again. Thanks to Rose and her team who were always helpful and kind to us. Thank you to Agoda too. Bed comfortable and room clean. 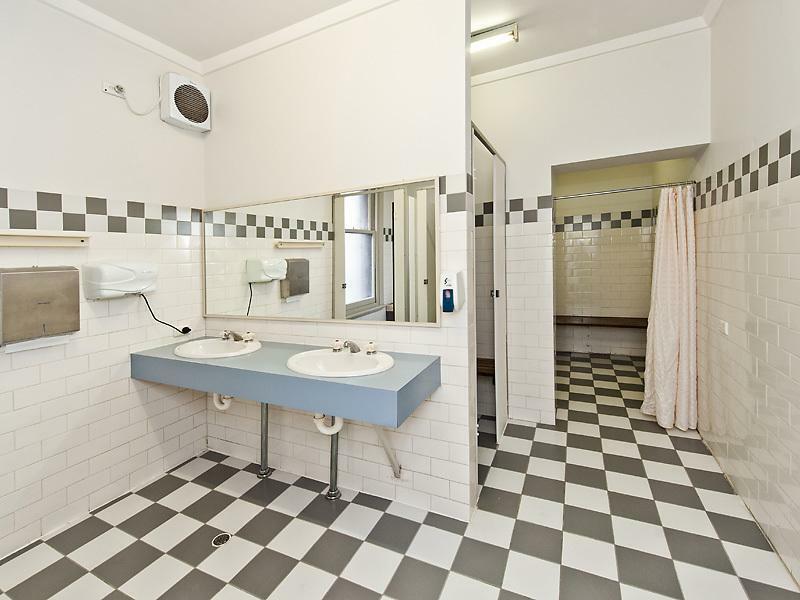 Place just mins walk to the free CAT line and 1 min walk to the train station to Fremantle and Mundurah etc. Hotel is also just mins away from the main shopping square which has many shops, coffee bars, pubs, restaurants etc. Within it is a large stage where crowds of people will gather daily and every Friday night, a party will take place there whereby various nationality food stalls are set up and live music performed. Food is cooked on the spot and one can enjoy the food while listening to the live performances on the stage. Some improvement though if at all 1) The check in process was not smooth. Reception struggled with my booking as I had booked, cancelled and then rebooked. Also hotel located just beside nect to a rood junction and each weekday from 6am onwards one can hear some traffic noise. It's a nice classic hotel. Like the thick carpet. Only problem is that there's no proper instructions given for the sign in over the weekend when there's no staff at the hotel. We had to drag all our load to the affiliated hotel only to be told that we were just signing in at the other hotel due to staff shortage and had to drag our load all the way back again. If the signage had been clearer, we would have just made one person stay at the door with all the load and the other go sign in to collect the keys! There's also no lift, thus was really tedious for us moving all our loads up and down. It would have been useful if it is indicated in the hotel facilities that there's no lift! The hotel is in good location for travellers who take train. Very near train station. I didn't see hotel parking and not easy to find a parking. The room can be very quiet or noisy..depends on the room location. But noisy room can find free perth wifi. The room we stayed was quiet and clean. The 2 bedroom apartment we stayed. .even had a small lovely dining table and chairs...however not every 2 bedroom apartment has that table. Better check the staffs when checking in. Overall we were happy with our staying in the Royal hotel. Will stay there again next time. Excellent location right in the city and close proximity to public transportation. Getting to anywhere in Perth was a breeze in the CAT, trains, buses. Staff on duty was satisfactory and informative but nothing outstanding. Although room appears tired, it was clean and very well maintained. The TV was placed in a funny position but the biggest dissatifaction was the lack of free wifi in the hotel. Below expectation, not value for money, very loud sound when use water tap in Bath room... noisy during Friday, can hear Cleary the music from the pub nearby... heater in one of the room not functioning properly, heater in both room produced loud sound on and off... inconvenience as reception counter not open during weekend and public holiday. Location is quite central but the front desk closes at 5PM, which I should have known. I came at exactly 5PM and the door was already closed. They did let me in after all but not without some grumbling. Seriously if I came at exactly 5PM you should have treated me normally. Hospitality staff in Australia can be awful sometimes. Overall stay bad. Hotel condition quite old and experience no air conditioning at all but the rooms are not bad. Staff very bad and not polite. The hotel should not maintain the staff at all (only knows 1 staff there). No parking, have to make check in in anather building and walk with lugagges. No elevator, construction in the front hotel, room small and uncomfortable feeling stay there. Bathroom outside shared with all floor, maybe about 10 rooms. Morning not easy get free toilet... doors to bathroom have funny locker for password. Shower cabin small and when open water have voice like something can be broken for a moment. I cant reccomend this hotel because in offer room have not clear information about shared bathroom. We reached on Saturday evening and went to the sister hotel for check-in before proceeding to Royal Hotel. Its a short 2 min walk. We are really paying for the location. 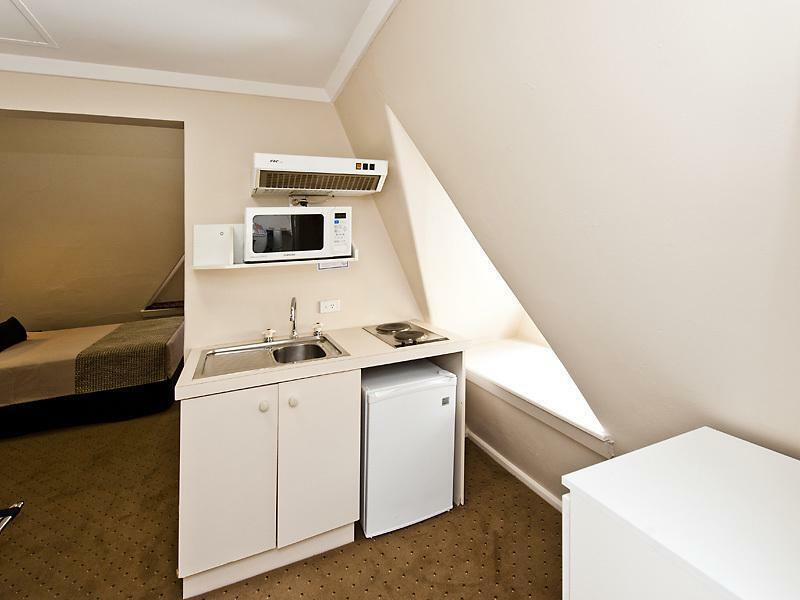 Basic hotel facilities, nothing fanciful but we are perfectly fine with it. Many great restaurants around the hotel: Jamie Oliver's, Ribs & Burgers, East Village. The front of house staff (porters and reception) were fantastic. The breakfast dining was good. The spa was excellent. I've stayed in 3 different room types and not sure any incremental cost was good value for money so would opt for the cheapest rooms in future. The cleaning in one of the rooms wasn't up to standard so there is an inconsistency here. The proximity of electricity sockets to the furniture is poorly designed: some table lamps therefore being unusable, and kettles having be placed randomly on the floor. I didn't let these things spoil my stay and would use the hotel again. 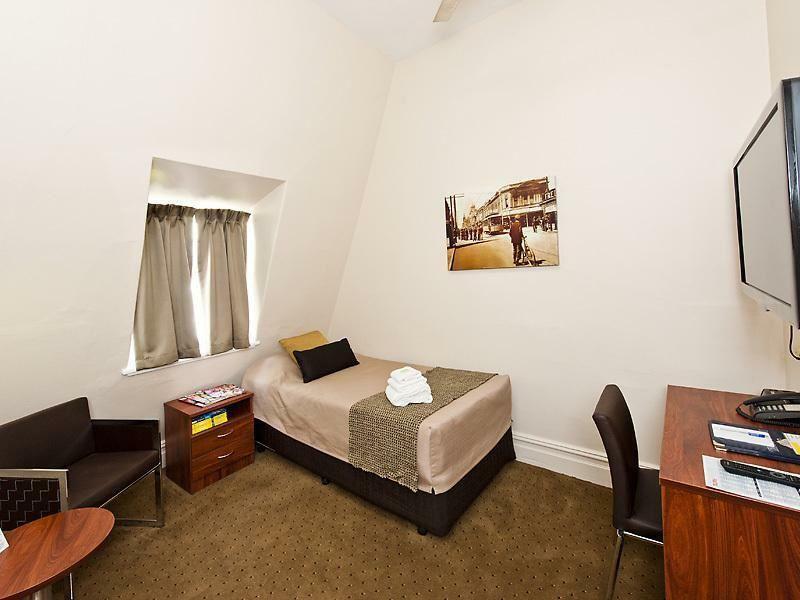 a good stay room was clean and close to train and bus station, don't expect to much un like Asia where a similar priced room will get you a 4-5 star hotel in Perth it will get you very little for the same price.